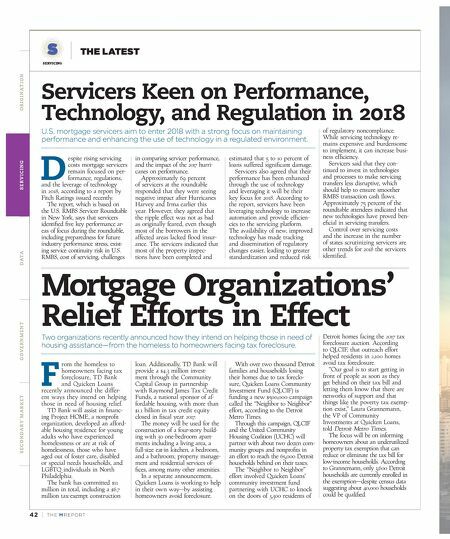 TH E M R EP O RT | 43 SERVICING THE LATEST O R I G I NAT I O N S E R V I C I N G DATA G O V E R N M E N T S E C O N DA R Y M A R K E T Technology Powering the American Dream TM Every day, thousands of mortgage pros like Nichole use Ellie Mae's digital mortgage technology to deliver the American Dream faster and easier to homebuyers everywhere. Join your peers and tell us how you power homeownership for a chance to own a tiny house, win a $15K Airbnb vacation gift card or have $15K donated to Habitat for Humanity ® in your name! Nichole Thueson, Loan Officer "I CLOSED OVER $2 MILLION LAST MONTH. FIRST TIME EVER!" Now that's how you power the American Dream. 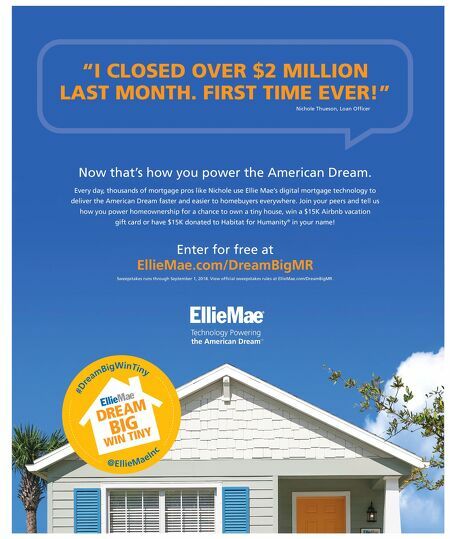 Enter for free at EllieMae.com/DreamBigMR Sweepstakes runs through September 1, 2018. View official sweepstakes rules at EllieMae.com/DreamBigMR.